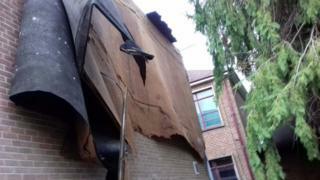 Storm Ophelia blew part of the roof off St Joseph's College in Belfast and damaged other school buildings, the Education Authority (EA) has said. All schools closed as a precautionary measure on Monday and Tuesday as the ex-hurricane battered Northern Ireland with winds gusting up to 80mph. Contractors were hired to fix the roof of the college on the Ravenhill Road. The EA also drafted in workers to clean up fallen branches and other debris from schools around the city. It tweeted photos of the clean-up operation on Wednesday as pupils returned to school. About 180 trees and branches were reportedly felled by the storm, and more than 50,000 homes and businesses lost their electricity supply. However, some principals and parents were critical of the decision-making around the school closures. The EA had sent an e-mail to headteachers on Friday 13 October, warning about the possible impact of Ophelia. However, at that stage no closure of schools was suggested. At 22:22 GMT on Sunday 15 October, the Department of Education (DE) advised all schools to close, in a tweet posted from the Northern Ireland Executive account. Many principals had to try to contact parents and pupils late at night and some complained that the announcement should have been made much earlier in the day. The storm had eased by Monday night, but schools remained shut on Tuesday "to avoid any potential risk to life". The department's decision divided opinion on social media, with some parents arguing that two days off school was "ridiculous" while others said the safety of children was paramount. The Republic of Ireland bore the brunt of Ophelia - three people were killed in storm-related accidents. The Irish government declared the storm a national emergency and instructed all schools to close on Monday and Tuesday.